Magical. Thank you AcadiA Pharma 🧡💪🏼👍🏼🌎 Wow. Keep pushing up ⤴️ #Parkinsons awareness. 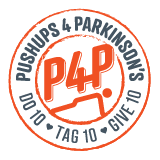 This is "Pushups 4 Parkinson’s Challenge Video" by ACADIA Pharmaceuticals on Vimeo, the home for high quality videos and the people who love them. When the little guy challenges PO Billy Osborn to a push up contest at the street fair things get serious! And yes, the little man won! If we asked you to donate $10 every year, on 10/10, would you consider it? Hey @coreandmorefit 🧡 We call you out for a #pushups challenge on Monday April 15, #Tax day, at high noon, your parking lot 5039 Main St. Shallotte. Do you accept?